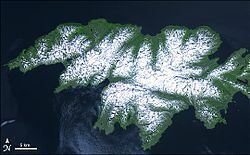 Attu Station is a census-designated place (CDP) located on Attu Island in the Aleutians West Census Area in the U.S. state of Alaska. The population was 21 at the 2010 census, consisting entirely of coast guard personnel who resided and worked at Casco Cove Coast Guard Station, but left the island when the station was closed in August 2010, leaving it uninhabited. LORAN Station Attu had provided a navigational signal for mariners of the North Pacific since the 1970s. After the Japanese invasion of Attu Island and the battle to retake it, the United States government constructed a LORAN station on the southern tip of the island, at Theodore Point. The equipment to build the station came from Holtz Bay and was ferried on barges and landing craft to Baxter Cove, about one mile (1.6 km) east of the station. Bulldozers were used to cut a road from Baxter Cove to Theodore Point. In 1960 the station was moved to Casco Cove, near the former United States Navy base at Massacre Bay. Later it was moved to Massacre Bay. LORAN Station Attu ceased transmission of the LORAN signal Feb. 8, 2010 and the Russian-American signal ceased on August 1, 2010. According to the U.S. Census Bureau, the CDP has a total area of 143.6 square miles (371.9 km2). 142.6 square miles (369.3 km2) of it is land and 1.1 square miles (2.8 km2) of it (0.75%) is water. As of the census of 2000, there were 20 people, 0 households, and 0 families residing in the CDP. The population density was 0.1 inhabitants per square mile (0.039/km2). There were 0 housing units at an average density of 0.0 per square mile (0/km2). The racial makeup of the CDP was 18 White, 1 from other races, and 1 from two or more races. Five of the population were Hispanic or Latino of any race. In the CDP, the population was spread out with 7 from 18 to 24, 12 from 25 to 44, and 1 from 45 to 64. The median age was 30 years. There were nineteen men and one woman. Males had a median income of $26,250, which is the same for the female. The per capita income for the CDP was $26,964. None of the population was below the poverty line. As noted above, however, due to the closure of the station the community is presently uninhabited. ^ "Alaska Coast Guard says goodbye to its last LORAN station". KUCB News. Unalaska Community Broadcasting. August 27, 2010. Retrieved March 25, 2013.